It used to be a water-filled ditch until about 1930, part of the Morris Canal and lock system built back in the 1800s to bring commerce from western New Jersey down to Newark, Jersey City, and New York. Lock Street in Newark (near the Warren Street subway station stop) was where one of the many locks was located as the barges made their way slowly down the canal to market. Mom said her brothers always took a summer swim in it. As progress overtook the canal with railways, roads and later airways, the need for a high maintenance canal rapidly faded, and with it Newark changed its section of canal into what we know today as The City Subway, the number 7 line. The tile murals on the walls in the underground stations starting at Warren Street show what life was like along the canal. At first, they thought about putting buses in that old hand-dug ditch, but wisely opted for a less polluting, quieter rail line, with many spurs that fed other street-level trolleys along Bloomfield Avenue, Park Avenue, Orange Street, Street, Norfolk/Central Avenue, Washington Street; and stretching out to Market Street, Roseville Avenue, and the Oranges. The number 23 line went all the way up to Our Lady of Lourdes Church in West Orange at the foot of Eagle Rock Avenue and Main Street. There is a bus station there now. 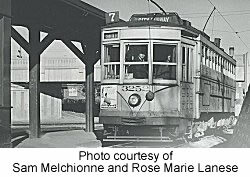 In 1954, the last street level trolleys disappeared from Bloomfield Avenue, leaving only the main spinal column, of the once extensive trolley network. I can remember the old trolleys, just barely. Many of the now prevalent bus lines are numbered in the same manner as the original routes for the once clanging trolley lines. There was a trolley barn at Lake Street and Bloomfield Avenue, which later became a bus garage and is now completely gone. The other big barn along Bloomfield Avenue was in Montclair, which later became a big bowling alley (Belle Clair Lanes) and is now the site of high-priced condos. Things change. There was also a Roseville barn. The City Subway now has been extended past its last stop at Franklin Station (re-named Branch Brook station) thru to a new Silver Lake station at the corner of Heckel Street and Franklin Avenue, and goes all the way down to Grove Street in Bloomfield near Bloomfield Avenue…… near where the old Charms plant and the freight yard used to be (near Ampere Parkway and Bloomfield Avenue). Got fancy new white double cars now too, and a new maintenance facility at Grove Street too. They moved the trolley repair shops there…… from their original home under Penn Station. Did you ever wonder where the trolleys went after they dropped you off at Penn Station, disappearing into what seemed like a dark maze under the station? Then they emerged again later to start their route all over again. Many of us rode the subway all over the north and central wards. Heading downtown? Take the subway…..be there in 7 minutes. Leave your house at 8:00, be sitting at your desk in downtown Newark at 8:30. Clean, no bus or auto fumes to inhale. Watch the sun rising up over the Cathedral on a cold clear morning with that subway car all toasty and warm. The trolley starters at Franklin, Bloomfield and Park Avenue stations, remember them at the back doors getting everyone on board safely and pushing the rear buzzer button so the driver would know when to start on his way? I used that little rail line every day to go to N. C. E. and then to work at PSE&G Know every tree along the route through Branch Brook Park. After many a tough day at school and later work, that gentle rocking along the road bed seemed to soothe the bumps and made me feel a bit more relaxed. Remember that clikkitty-clack noise of the wheels? The new cars don’t make that sound anymore. They glide instead. I prefer the noise. It was part of the experience. I enjoyed the fast ride you got between Orange Street and Park Avenue when the driver opened her up a bit. If you sat in the back you experienced both a swaying and a bouncing motion. This happened again when you left Davenport Avenue and sped toward Heller Parkway. The old Heller Parkway station is closed now in favor of the New Branch Brook Station. The connecting buses still stop at the Branch Brook Station, there on cobblestone-lined Anthony Street. At night I remember seeing the sparks from the overhead contactors on the wires. What about those big globe lights at the station stops at Bloomfield Avenue and Park Avenue, remember those? And the signs that flashed….”Car Coming” to let you know a trolley was approaching? So visual an experience it was, a little bit of European flavor right in our own backyards. Big stately trolleys they were, gone now, and the memories fading faster as we age. They rebuilt the overhead lines too, and gone are the bright blue sparks as well. When they tore down the old PSE&G terminal building in 1981, I watched from my office in the new tower building the day they tried to smash the old incline that lead into the back of the building where the trolleys entered. The wrecking ball just bounced off it. They hammered at that incline for days, and finally dynamited it and the remaining foundations. They found some old trolley tunnels down there and pulled out two demolished cars they had forgotten in a sealed tunnel. Just a couple of years ago they re-discovered the old underground Cedar Street spur line that opened out onto Washington Street. That line ultimately led into the basement of the original PSE&G building. That whole area is honeycombed with tunnels, and abandoned underground stations and boarded up store fronts. I suppose when they dug out the Military Park underground garage, and the new PSE&G skyscraper it probably capped off those once busy tunnels leading into the terminal building. Like I said, things change. Every now and then, some street work in downtown Newark exposes the sleeping rails and switch tracks. People gawk and find it hard to believe, especially if they are young. So much we now depend on autos, it is hard for folks to imagine a time when trolleys were king. Rumor had it you could walk underground from PSE&G, all the way to Bambergers. I don’t doubt it. I understand that before WWII there were plans to expand the underground subway all over the downtown area, like NYC, but I guess it never did get any serious attention later. Too bad. It would have been quite a nice way to escape the surface level traffic and winter weather. The City Subway is a rather famous trolley line. Been written up in quite a few websites and histories about inter-urban transportation systems. The City Subway will always be my little time machine, reminding me of how I grew up in Newark. I still ride it, even if it does have new cars. But I remember the sights and smells of the old cars and that’s what I experience whenever I ride it. Things change……. but not completely.